SD-WAN presents a transformational opportunity for Telcos and MSPs to offer value-added services. 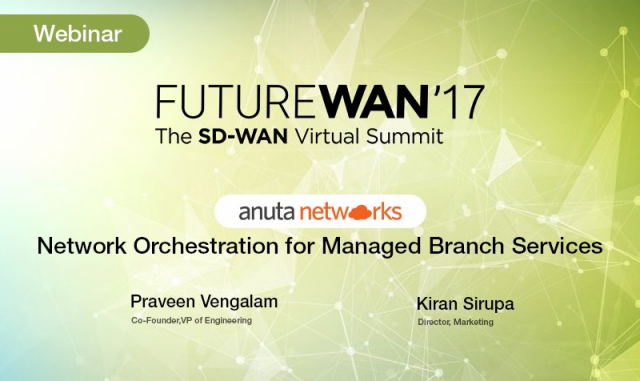 Anuta orchestrator bridges the multi-vendor legacy and SD-WAN infrastructure for a smoother transition. Watch this webinar to learn about Anuta's SD-WAN and vCPE customer deployments at global Tier-1 MSPs. Introduces a graphical designer to automate network provisioning and maintenance activities using low-code automation. ATOM Network Workflow Automation eliminates human errors and empowers network administrators to focus on strategic business outcomes rather than mundane daily tasks. In this video, we share some of Anuta ATOM customer deployments including Tata Communications, Neustar, F5 Networks, An Energy Provider in APAC and a Financials Services Enterprise in the US. Closed-Loop Automation ensures the system works as intended by closely monitoring network analytics and taking corrective actions. In this video, we discuss the 5 real-world applications of CLA for Telecom providers, App Delivery, Financial Services, Managed Services, and SD-WAN. Explains Telemetry, Analytics and Service Assurance using Anuta ATOM. Explains Network Device On-boarding and Software Maintenance using Anuta ATOM. Difference between Network Automation, Network Orchestration, and Closed-Loop Automation. Explains WAN, MPLS, SDN, SD-WAN with simple analogies. Explains the concepts of VLAN, ACL, VIP, VPN, QoS with analogies. The leading networking vendors and the life of a network administrator to manage the devices. Introduction to Switch, Router, Firewall, and Load-Balancer using simple analogies. Fundamentals of networking with analogies and stories for those who are new to networking. - What is a computer network? - Why do we need networking? - How networks help businesses? Anuta ATOM Multi-Vendor SD-WAN Automation solution provides a centralized management plane and orchestrator for SD-WAN and existing branch infrastructure. ATOM provides assurance, analytics, and orchestration to multi-vendor SD-WAN controllers, physical and virtual branch CPEs, next-generation firewalls, and WAN optimization devices. It reduces human errors and delivers consistent policies across the WAN infrastructure. ATOM’s powerful analytics and closed-loop automation help in creating self-healing and smart networks. Anuta Networks won the 2019 SD-WAN Implementation Award by TMC. In this presentation, Anuta Networks CEO, Chandu Guntakala shared the latest Anuta ATOM deployment details as well as key learnings from the multi-year IZO SD-WAN project roll-out at Tata Communications. PoC combined Anuta Orchestrator, HPE Helion OpenStack, Virtual Router (VRS) and HPE DCN SDN controller. F5 Networks deployed Anuta Solution in their private cloud for Silverline DDoS protection and WAF. Mike Lechner, who evaluated multiple orchestration solutions including Anuta Solution, Cisco NSO, Ansible and Puppet discusses his journey to Network Orchestration. Mike chose Anuta Solution for its flexibility, multi-vendor coverage, scalability and excellent support from Anuta team. Tata Communications (TCL) is a leading global Tier-1 SP offering IZO SD-WAN for managed branch customers across 130 countries in 700 cities. TCL team evaluated multiple network service orchestration solutions including Cisco NSO, Glue Networks and Anuta for their multi-vendor infrastructure consisting of Cisco, Riverbed, Versa and Juniper. They chose Anuta solution for flexibility, multi-vendor coverage, scalability, development toolkit as well as customer service. Listen to Peter juffernholz, AVP of Virtual Network Services about their experience of introducing DevOps into their organization and the challenges they faced including organization alignment, training of current staff and developing service models. Using Anuta solutions, TCL reduced CPE provisioning time from 60 minutes to 5 minutes. Anuta ATOM is a vendor agnostic, multi-domain and multi-cloud network automation solution that helps enterprises and service providers build smart, predictable and responsive networks for current and future infrastructure needs.